What is your phone doing behind your back? Maybe its time you stop wondering. Look no further for your Android Firewall. With Mobiwol you can- - Take Control Of Your Mobile Apps - Easily Allow/Block App Connectivity - Be Alerted When New Apps Access the Internet with No ROOT access required! Regain control of your mobile device and what is being accessed and shared with the world. Features List NO- ROOT REQUIRED!! Automatic launch on device start up Automatically identifies applications currently installed on your mobile device Identifies and Notifies when newly installed apps access the Web Allow/Block, on a per-application basis Disable background activity for selected apps Get full data usage visibility Simplified Android Security Why does Mobiwol show as if using a VPN connection? This is superficial. We-ve used technology available to us from within the VPN packaging module offered by Android to be able to gain visibility to your applications- network activities. However, no actual VPN connection is being made, no data is being sent externally by our application, and we do not tamper with the security of your personal data, so you can continue using your apps with peace of mind, and confidence that you will not end up with a higher than usual data bill at the end of the month. 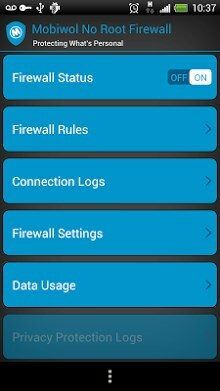 Please review Mobiwol - NoRoot Firewall application and submit your comments below. We will collect all comments in an effort to determine whether the Mobiwol - NoRoot Firewall app is reliable, perform as expected and deliver the promised features and functionalities.